When is it important to puppy proof your home? The answer is easy: Long before your puppy comes home for the first time. 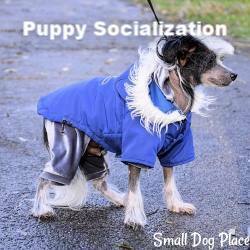 A small breed puppy is not like a large breed puppy that can do substantial damage in a short period of time. They are also not like a human toddler or preschooler who have their own ways to stir up trouble. But as a pet parent you will want to keep them safe and out of harm’s way while protecting your possessions from the puppy. That is why you will want to puppy proof your home. By now, you're probably asking yourself, what's the big deal? How much trouble could a small puppy get into anyway? After all, they can’t knock over a lamp with the swish of a tail or reach the counter and eat your birthday cake. The answer is that they can do a tremendous and often costly damage in a short period of time, even when you are in the same room. Maybe I really don't want a puppy after all. Puppies as well as older dogs are opportunists. They see something they want and if there is not a person to tell them otherwise, they will seize the moment. The good news is that much of this can be eliminated by a few simple changes to your environment. Puppy proofing is neither difficult or time consuming. It just requires a little thought. Anything that is on the floor in the room or area you have set aside for your puppy is fair game including the floor itself. Unless you watch every move your puppy makes, he can get into trouble very quickly. A curious puppy can either get hurt or destroy anything in his path. Neither of these are likely to have a happy outcome. 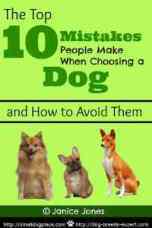 Some small breed puppies can be so calm and dependent that you are lured into a false sense of security. But don’t let them fool you—they are a very curious and curious little dogs can get into big trouble real fast. It is much easier if you plan to keep your new puppy in an exercise pen which is tastefully decorated with two dog bowls, a crate and/or bed, some toys and some wee-wee pads. In the sanctuary of an x-pen, your puppy and your belongings are safe. What if you don’t have an x-pen? I can remember the very first puppy we ever had in a small apartment where there was no room for an x-pen. The logical place for the puppy while we were at work was the bathroom. It was tiled, no rugs and a convenient place to put down food and water bowls, a bed and the various sundry toys that we had purchased, plus plenty of pee pads. Were we ever surprised when we came home from work to find the puppy comfortably resting on three rolls of shredded toilet paper which flooded the entire bathroom about 4 inches deep! On to plan B, we decided. An exercise pen or x-pen as they are often called can provide an excellent puppy to sleep, eat and play. Most puppies will grow accustomed to his area but some are quite vocal in their protest of being confined. Another option is a puppy play pen. A smaller container than an x-pen, but still spacious enough to add a couple of bowls, a bed and a few toys. Here are a couple of examples of exercise pens and play pens to help you puppy proof your home. A third option is a crate that is big enough for the puppy to lie down, stretch out, stand up and turn around. 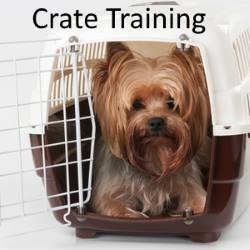 There isn't much room for bowls and pee pads, but those extra items defeats the purpose of crate training. It is cruel and unhealthy to keep a tiny puppy in a crate all day while you're at work. Unless you can arrange for someone to come in to let the puppy out to relieve himself during the day, the crate method of potty training will not be effective. Another idea is to choose a small room such as a bathroom, kitchen, laundry room or other room that is not carpeted. The room can be partitioned off by the use of infant gates. A four by five foot area is all that a small puppy really needs. His area should be big enough for a bed or crate, a food bowl and water bowl or bottle, toys, and pee pads. So what are some of the things that puppies find irresistible? Puppies love to put things in their mouth, chew and often swallow items small enough. Chewing will be your biggest challenge initially while your puppy is teething. Finding something to chew on helps ease the pain of teething. Having lots of interesting chew toys will definitely help. Don't expect your puppy to limit himself to store-bought chew toys. Anything that looks interesting to a puppy is a potential chew toy. Puppies are strangely attracted to anything made of wood. This includes your great aunt's antique chair. To protect your wood, whether it be furniture, baseboard or molding, you will need a product that makes the wood taste terrible. This product claims to be twice as bitter as other products, alcohol-free and contains tea tree oil; it's safe on furniture but spot check it first before using. 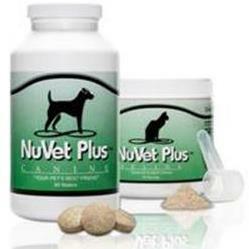 You can also use it on your dog's skin to prevent hotspots or on a bandage to keep a dog from licking and biting at it. As with any product, not all dogs respond the same way. What works great for some may have little effect on others. Most puppies grow out of this excessive chewing stage by the time they become adults. But even adult dogs love to chew, so you will want to satisfy their chewing needs with something other than your possessions. While most of the items are relatively harmless to your puppy, some can be deadly. 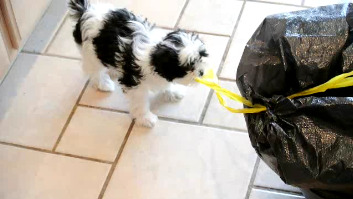 Even some of the less dangerous items can be used by your clever puppy to create the mess of a lifetime. Now, after an exhausting day at work, do you really want to come home to a huge mess? If you puppy proof your home, you can spend an enjoyable evening with your puppy sans the mess. Some things however can be dangerous such as electrical cords, poisonous plants and chemicals. Need I mention the cost to repair, so the more items you can segregate from your puppy, the more puppy proof your home will be. If you have an outside garden where your puppy will spend some time, consider puppy proofing that area also. Outside, a large yard with lots of flower beds make a digging puppy very happy. Again you don't want to remove the flowers just to puppy proof the property. If your property is fenced, walk the perimeter to assure that there are no openings in the fence that a small puppy might squeeze through. Pick up any loose garden tools, tree branches that have fallen or anything that a small puppy might find irresistible. Puppies love to find things like small stones, leaves, small sticks, pinecones, basically anything that is new to them. They will try to chew or eat them. At this point, you may be thinking, what about plants? Are any of them poisonous? Yes, you will want to make plans to replace dangerous plants with dog-friendly ones. A small puppy should never be left alone outside. Constant supervision is a must. As I mentioned earlier, if you are planning to keep your puppy in a small room, getting a gate is an excellent idea. Closing the door to a small room with the puppy on one side and you on the other will create anxiety and even panic in your dog. Most dogs react to closed doors by scratching on them, barking, howling, whining and crying. It's best to use a gate where your puppy can see what is going on in his environment. Baby gates are great for keeping your puppy confined to one room or out of another room such as a craft room. Gates keep puppies safe at the top of the stairs or secure at the bottom. But, be sure any gate you get has adequate protection. 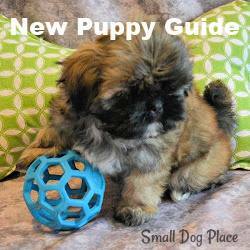 Small breed puppies can be very tiny and tend to get through the gate easily. Choose one where the bars are placed close enough to where a puppy can't squeeze through. Gates come in all shapes, sizes and colors. Materials used in these gates varies from wood, plastic, steel, or a combination. Some are decorative and fit in nicely with your home's decor. Some can be mounted to the wall permanently while others are pressure mounted and can be removed instantly. They vary in height, some being designed for larger dogs. I have not found any of these gates to last for the lifetime of a dog. Most are built with infants and toddlers in mind. A home with very young children might need a few gates but once the child is older, the gates are taken down. Some dogs can squeeze through even the smallest of openings. Some dogs learn to climb over the gates. Keep these thoughts in mind when choosing a decent dog gate. Dogs and puppies can be very quick. If they see you eating a snack, may puppies will want to investigate. Put a snack down where a puppy could reach it and it might spell disaster if that food happens to be toxic to dogs. A guide on how to puppy proof your home would not be complete without a mention of all the foods dogs should not eat. Most seeds in fruit such as apple seeds, cherry pits, peach pits, etc.. So, going back to the analogy of a human toddler, what do you do when you must take away all these wonderfully enticing yet forbidden objects---Substitute! To puppy proof your home also means providing acceptable things that puppy can chew, such as bones and toys. Get a good assortment and when the puppy wants to chew on an unacceptable object, take it away and hand him his bone.